Imaging In Italy - photo tours in Rome, Florence & Venice Italy: morning, afternoon, full-day, twilight, and portrait tours to suit your schedule and needs. Learn how to make stunning photos with an expert guide and professional photographer. The morning light in Rome is ideal for capturing the beauty and magnificence of the Eternal City. On this tour we will visit six of Rome's most famous historic sites such as The Colosseum, the Roman Forum, the Campidoglio, Piazza Matei, Teatro Marcello, and the Pantheon. Spend a remarkable day in Rome making captivating photos, visiting fabulous sites, and enjoying authentic Roman cuisine and Italian culture. Whether you are a novice or professional photographer, you will have a truly unique experience in an extraordinary setting and a rare opportunity to ask the expert about camera techniques used by world-class professionals. 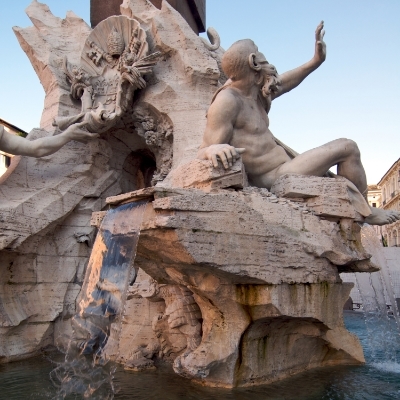 Rome is more than inanimate monuments and marble statues. It is a vivacious city shaped over the ages by emperors, artists, and architects who, in building the Eternal City, created a remarkable human story where gods, angels and demons lived. Rome after sunset is magical and we would be remiss if we didn't include a special Twilight Photo Session. From dusk on, the light and colors are magical, offering an opportunity to make captivating images of Rome while learning new techniques to capture the magical light. Celebrate an anniversary, wedding or other special occasion in Rome. Let our expert, bilingual photographers capture the spontaneous emotions and expressions that tell your story in the Eternal City. We'll send you a CD with the best photos for you to cherish.